This custom baseball nightstand is hand built from solid, full length, American timber. Like all of our wood products, it is hand hewn with mortise and tenon joinery. This makes for a bedside table that will stand the test of time. At the customer's request, this nightstand was built to represent America's pastime. On top, the table features a granite inlay baseball diamond. The custom cabinet knobs, are also made in the shape of baseballs. The custom knobs are hand forged from solid wrought iron by our master blacksmiths. This unique baseball nightstand is handmade to fine art specifications under the supervision of world renowned designer H.J. Nick. A true family heirloom quality piece that can be passed down for generations. Our in-house master wood workers and blacksmiths handcraft all of our custom furniture To Last Forever custom furniture will stand the test of time and is guaranteed forever - call now for details 1-800-292-0008. 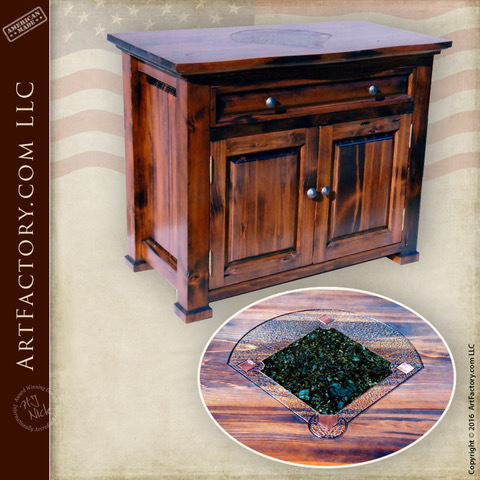 ArtFactory.com an American manufacturer of handmade dining tables, custom furniture, wood doors, gates, and designer furnishings based in Scottsdale, Arizona, and Designs by H.J. Nick, have been designing and building some of the world's finest furnishings all hand crafted in America since 1913. Most of our clients want a furnishing that has a big WOW factor and timeless elegance. They all want investment value furnishings that make a proper statement reflecting their personality, or the personality of the environment for which the designer custom furnishings are intended. Our master level craftsmanship ensures your custom wrought iron gates and furnishings will stand the test of time, and are Guaranteed Forever, backed by over a century of fine craftsmanship.